Chanced upon Bynd Artisan, which builds on its founding company's legacy of making and designing books by hand, when I was shopping at Tangs Orchard. As the customised notebooks are bound by twin-wire, chose to buy its book jacket and fitted a journal in instead. Made of natural-grained cowhide leather with suede inner lining and linen thread stitching, the book holder came with a leather bookmarker. With name embossed on the inside of the book jacket so the customisation was subtle, it was prettily packaged – placed in a leather box with black paper, and made an elegant gift. When I knew Bynd Artisan also shares its book-binding and leather-making expertise with hobbyists and aspiring craftsmen, I have been keeping a lookout for its workshops. There were a few times that I could make it but was too slow in booking so the timeslot was no longer available. Finally, the stars were aligned last month for me to sign up for its Leather Qudro Workshop this month. Attended the workshop opposite Holland Village, along Jalan Merah Saga at Chip Bee Gardens where The Daily Scoop was, to learn the fundamental techniques of working with leather. We started with drawing outlines of a coin pouch, cardholder, key tab and bracelet using the templates given on our choice of leather. I had to draw many times to ensure the lines and dots made by the black pen ink could be seen on the leather upon removing the templates. Next, we punched holes with the tool provided (loved this step the most) before skiving the folding lines. 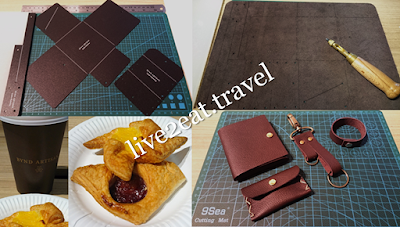 Understood from someone who had tried its Basic Leather Card Holder Making Workshop that it was not easy to skive, yet this is important for a well-made end product. Then, it was time to cut the outline where I found the round corners tricky. Last but not least was choosing accessories for the finishing touches – buttons to be secured using their respective machines, key rings, and thread for sewing the sides of the coin pouch. To ensure coins do not fall through, the thread has to be pulled real hard so the sides were pressed tightly together. With a break in between, where pastries with a cup of our choice of coffee or tea were provided, the workshop took about three hours. And I went home happily after that with four leather products that I made with my own hands.